This past week has been a bit crazy for me, as I've had to pack up over three years worth of my belongings and move into a new place (I know three years isn't that long, but somehow I've accumulated a lot of stuff - mostly junk haha). Not surprisingly, I've been relying on quick and easy meals that don't involve much cooking to get me through the process! 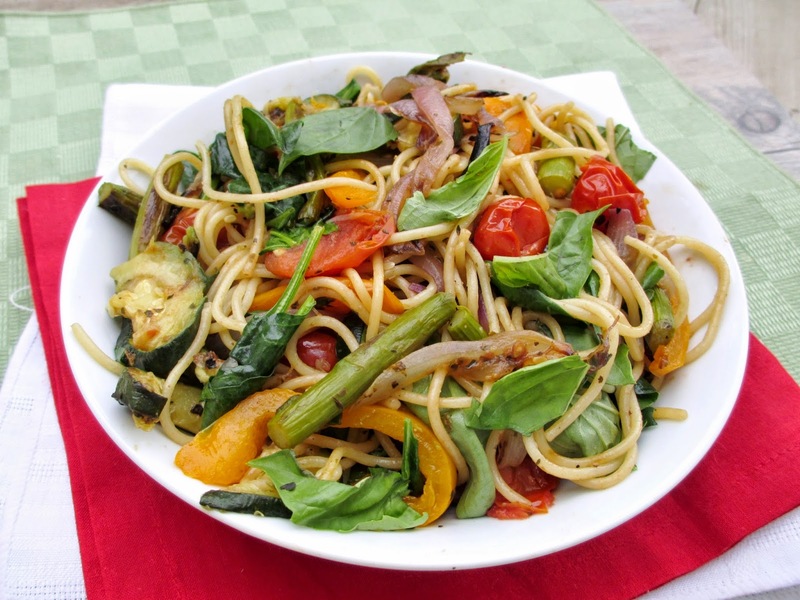 The first actual meal that I cooked for myself after moving in was this simple summery pasta dish of thin spaghettini noodles tossed with a variety of colourful roasted veggies and balsamic vinegar, and topped with some fresh basil. This dish was inspired by a recipe from the cookbook Appetite for Reduction, which used fusilli pasta and a slightly different mix of vegetables (I left out the yellow squash and added spinach and basil). 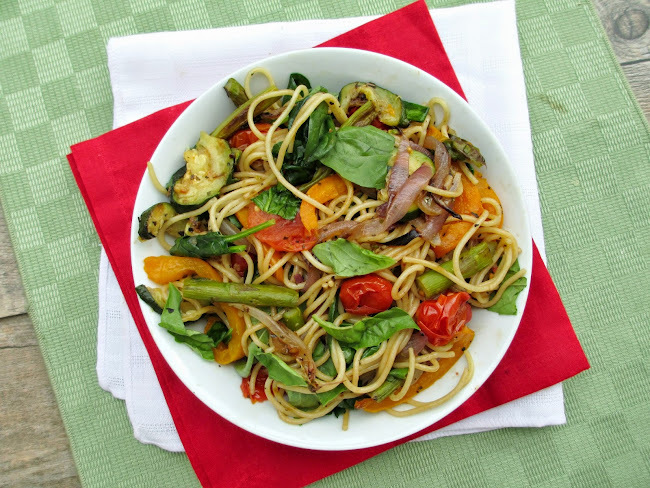 The original recipe was called a pasta primavera, but to me primavera usually implies pasta with veggies in a creamy white sauce, and this dish is quite different! 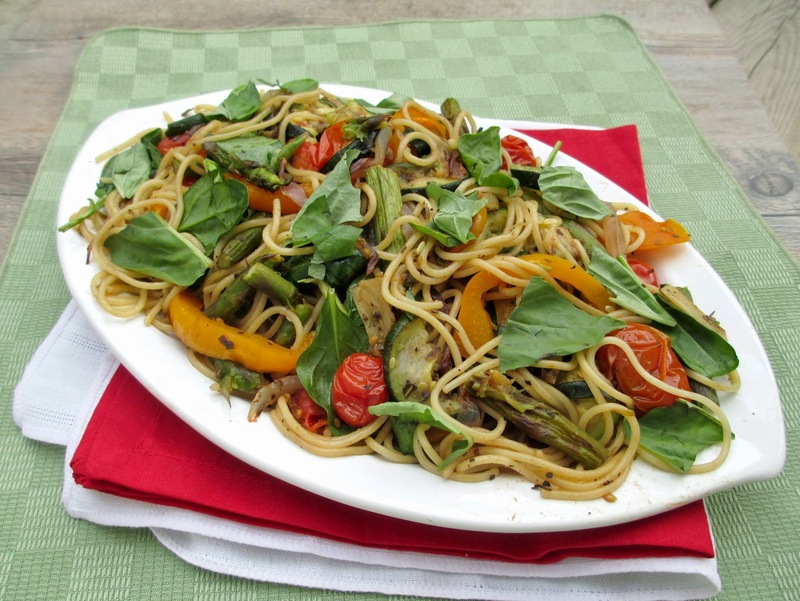 Instead of adding a sauce, the vegetables are simply roasted until tender with lots of herbs and garlic, then tossed with the noodles in balsamic vinegar for a nice light meal that really highlighted the veggies - perfect for summer evenings! The basil was a nice addition, and feel free to add other toppings you like, such as parmesan cheese, toasted pine nuts, or maybe even a touch of pesto! Preheat oven to 450°F and line two baking sheets with aluminum foil. Prepare the veggies: snap the woody ends off the asparagus and slice the stalks into smaller pieces (3-4 pieces per stalk). Slice the zucchini into half-inch slices. Peel the onion and cut in half, then slice each half into thin slices. Cut the bell pepper in half, remove the seeds and core, and thinly slice. Peel the garlic and cut into thin slices as well. Divide the veggies among the baking pans and toss with the olive oil. Sprinkle the dried herbs over top and season generously with salt and pepper. Toss to mix. Place in preheated oven for 15 minutes, then remove pans and give the veggies a toss. Return to oven for another 10-15 minutes, until tender and browned. Meanwhile, bring a large pot of salted water to a boil. Cook pasta according to package directions, then drain. Add the pasta and roasted veggies to a large bowl. Stir in the spinach so that it wilts. Add balsamic vinegar and toss well to mix. Divide into serving bowls, top with some fresh basil and season to taste with salt and pepper. You might want to add another drizzle of balsamic vinegar as well. Happy housewarming :) Hope you enjoy your new home and new kitchen. This sounds wonderful. Given that we are not vegetarians and need significantly more protein than is in this dish, I would serve it as a side dish. I definitely want to try it. Hope your new kitchen works out well and that you can get the oven to work well for you. Thanks so much! I agree that this would be a light meal on its own - it would be a good idea to serve it with a side salad and bread, or you could serve it with a main protein like grilled chicken maybe! 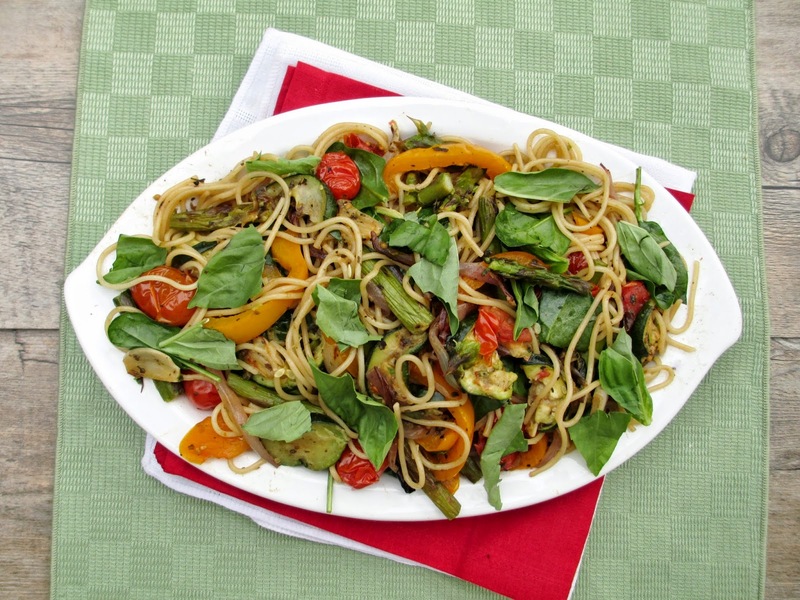 I'm always lookinf for ways to pair pasta and balsamic, so great recipe! You need to get a new stove, but in the meantime you can just get oven racks and use the other levels available? The bottom one should be too bad to deal with. Thanks! That's a good idea - I wasn't sure where to buy additional oven racks, but I'll have to do some research online!